The statement of cash flows, sometimes referred to as the cash flow statement, is classified by activity to provide more detail to help users to assess the ability of a business to generate cash flow from a particular activity. The classification of cash flows is based on the commercial substance of the transaction rather than its legal form. The classification of cash flows is carried out by identifying the cash flow with one of three business activities. 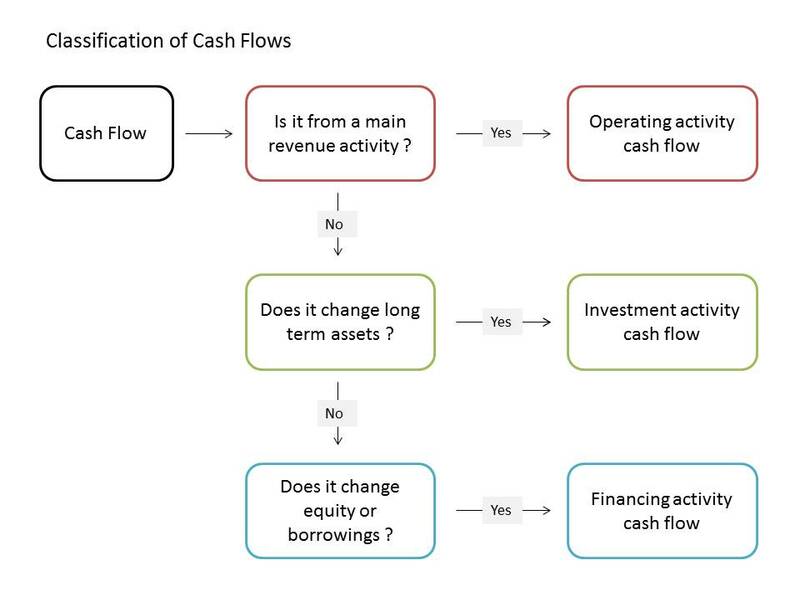 The identification and classification of cash flows into business activities is summarized in the illustration shown below. A PDF version of this diagram is available for download at the bottom of the page. Cash flows from operating activities are cash flows which are generated by the main revenue producing activities of the business, usually cash receipts from the sale of goods and services. The operating activities cash flow is a key indicator that the trading activities of the business can generate sufficient cash to keep the business operational, repay loans to lenders, and pay dividends to shareholders. Further details on cash flows from operating activities can be found in our operating cash flow from trading tutorial. Cash flows from investing activities are normally identified by whether or not they result in a change to long term assets (fixed assets). For example, the purchase of equipment results in a cash flow out of the business and an increase in the amount of equipment (long term assets) held by the business. The cash flow would be regarded as an investing activities cash flow. Further details on this type of cash flow can be found in our cash flow from investing activities tutorial. Cash flows from financing activities can be identified by whether or not they result in a change in either equity or borrowings of the business. For example, the issue of new shares changes the equity of the business, and the cash proceeds from the new issue would be classified as a cash flow from financing activities. Likewise, the repayment of a loan results in a change in the borrowings of the business and the repayment would again be classified as a financing activities cash flow. Further details on this type of cash flow can be found in our cash flow from financing activities tutorial. The classification of cash flows diagram used in this article is available for download in PDF format by following the link below.